Ordo Life — jo barnard. The Ordo team can to Morrama in September 2017 looking to design and produce the first 10,000 units of a unique electric toothbrush in 4 months. Leading the project I worked closely with the whole team to turn around the design phase in just 4 weeks. From here I produced the 3D CAD files needed to begin supplier communications and we began the development journey mid-October. Being really happy with the design direction the goal was to preserve it's elegance and simplicity whilst overcoming the engineering challenges as we moved through the design development for manufacture. To speed up the process sat down with the engineering team in person during a trip to China, and we worked together to solve the problems. 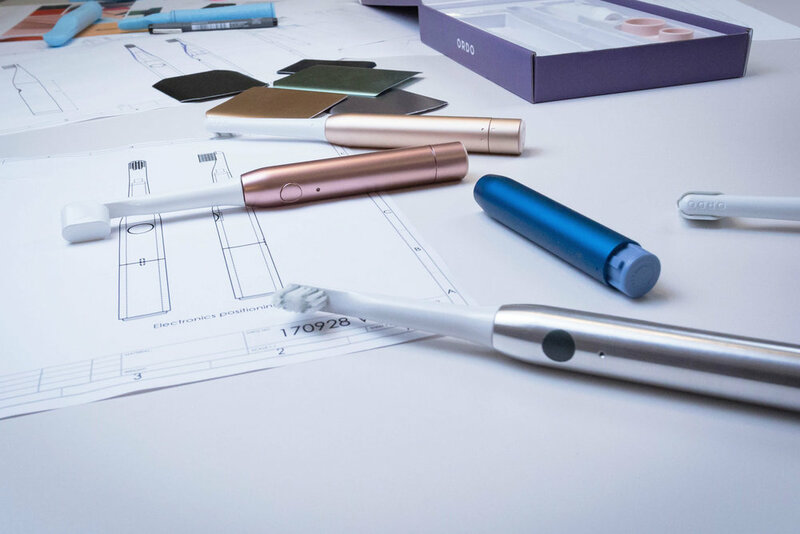 The ORDO product isn't just a toothbrush, but a service and a family of products. The brush cap, stand, toothpaste, presentation box & re-fill packaging went through the same level of design consideration in December to ensure a cohesive brand message and user experience. The first production run took place the week before Chinese New Year 2018 and ORDO will be on sale from 1st March. You can find out more about the process here.